After the success of my conversion to a Nissan F10 master cylinder on my Europa Special, I have decided to make a web page to give information and the parts needed to do the conversion. It is a simple and straightforward project and could be done in only a few hours if you have all the parts on hand. First, you need a 76-78 Nissan F10 master cylinder. I bought a NOS MC on eBay, but I think most large auto parts chains either stock them or can get them for you. I don't recall what I paid for the MC on eBay, but a quick search on Advance auto's website shows they have the MC available for $38.99 (remanufactured, new is $113.99). 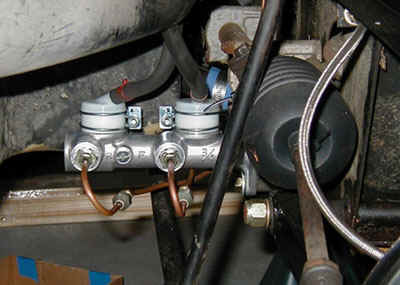 The master cylinder is 3/4" bore. Other parts needed are Tilton remote inlet reservoirs (Tilton's small reservoirs will fit as well but may make access difficult), inlet clamps, remote reservoir, Tilton's brake hose, hose clamps, and generic metric brake line fittings (more info below). The Tilton part numbers can be seen above next to the parts. What you need are (2) 74-212 remote fitting, (2) 74-238? clamp, (1) 74-214 30" hose. Hose clamps for the flex hose can be picked up at a local hardware or auto parts store. There are several options for the remote reservoir if you go that route. Tilton makes a small reservoir as seen above. I bought a very expensive AP Lockheed reservoir (see pic below) that holds nearly a pint of brake fluid and has two outlets. The Lockheed reservoir required a bracket to be fabricated so that it could be mounted level. As I mentioned before, Tilton's 4 oz reservoirs will fit the Nissan MC, and would make for a very clean installation. 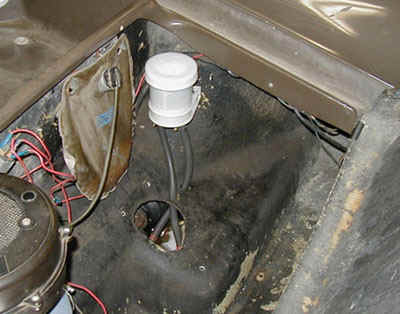 However, accessing the rear reservoir would be a problem unless some fiberglass was removed (S1/S2's may be different). One thing to note is what hose you use for the remote reservoir; brake fluid can melt or otherwise attack common hoses like PVC and fuel hose. I used Viton hose which was terribly expensive, so I think one could do better with Tilton's hose. 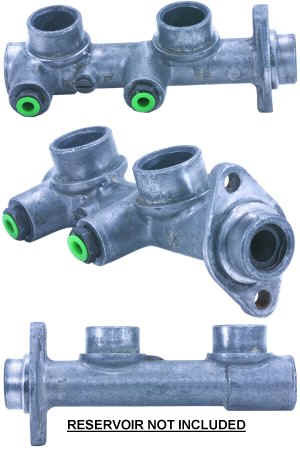 The brake fitting that are needed are metric. I'm not sure of the size, but just carry the MC to the parts store to get the right fittings. You need these fitting to either make up two adaptors to bring the lines to the opposite side of the MC (see pic) or to put on the ends of the existing brake lines if there is enough length. The adaptors may look a bit ratty or half-engineered, but they work just fine. No other parts are needed really, as the stock pushrod will work. If you do not have the original pushrod, you may want to try a generic one from Tilton or Girling. If you find another pushrod that works, let me know and I'll mention it here. 2. Use a lot of anti-seize on the studs so that they don't corrode. 3. Take your time and think things through!! Each installation will be different because of the differences in Europas throughout production. So, how does it work? It works very well as a matter of fact. The relatively small bore helps lower the force needed since my car no longer has the servos. The car stops quickly with only moderate effort. The feel is also great - better than any other car I've driven. My Europa has Kevlar pads on the front (EBC Greenstuff) and braided stainless flex lines which help braking considerably.